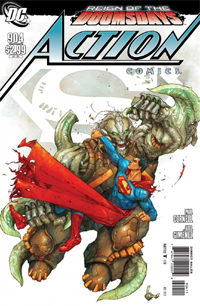 Hard to believe it, but this is the final issue of Action Comics. Sure, Action Comics (vol. 2) #1 comes out in a couple weeks, but that’s a whole different thing. It’s not this same title. It’s not the actual title with its roots in the dawn of the comics industry, the dawn of the super-hero, going back to even before World War II, touching on eight decades. But that’s mostly a discussion for the new Action Comics. This issue wraps up Superman, and Action Comics, and is basically the send-off for this title and these characters, at least for what I’m currently reading (I have not read Superman #714, nor the final issues of Supergirl or Superboy). We open with Superman discovering that the current threat to the world still ties back to Lex Luthor’s recent actions in the Black Ring arc. Talking with this willed-to-existence entity, Superman is restored to solid existence, to lead the heroes in a final attack on the Doomslayer to save their world. While Superman and the Eradicator (in a different but familiar form) take on Doomslayer, the others attend to the multiple Doomsdays. When all’s said and done, Clark and Lois talk over dinner, bringing this era of Superman, and aspects of the character going back a quarter-century, to a close. The main story seemed to wrap up a little too quickly for my preference. It’s not bad, mind you–but it just seemed a little quick. Perhaps it’s the time between issues combined with all the other stuff I’ve (as an individual) had on my mind and looking toward with the pending relaunch–but it doesn’t feel like the potential with this Doomslayer really had a chance to take off, and the heroes (as with a couple years back in New Krypton) handle the Doomsday threat a little too easily for what the character was created to be. That said, I found the closing to be a great touch and appropriate epilogue to this lengthy Doomsdays thing, which has been going on all year now, since that Steel one-shot back in early January. Given that it was the Death and Return of Superman “trilogy” that most firmly brought me back into comics in a way that I’ve never truly left since, it’s rather satisfying that Supergirl, Superboy, Steel, the Eradicator, Doomsday, and the Cyborg Superman were all brought into what turned out to be the final story of this title, and these characters. Visually, I’m not really impressed with the art on the main story segment. I’m not really disappointed, either…it’s just not a style that clicked well with me in reading this issue–something about it just felt off. The characters and action isn’t hard to follow, everyone’s recognizable and all–so it does its job as it should. The epilogue segment worked quite well, though–I’ve mostly enjoyed Gary Frank‘s work on Superman, and Cliquet does an excellent job of emulating that style. 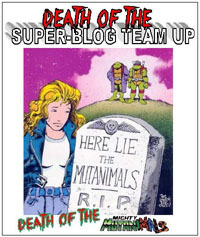 All in all…this issue’s for the longtime/ongoing readers. This is the end of Cornell‘s run on this title; this caps off a quasi-crossover sort-of-“event.” This is the end of Lois & Clark, at least the Lois & Clark of the last 15 years. This is likely the last of a lot of other familiar elements and possibly actual characters that have been part of the Superman story for a generation of readers. This goes out with neither whimper nor bang…but leaves things so that maybe someday, this iteration of the characters can be revisited.